Energy Metals Limited is a dedicated Australian Uranium exploration company with a portfolio of advanced projects located in the Northern Territory and Western Australia. 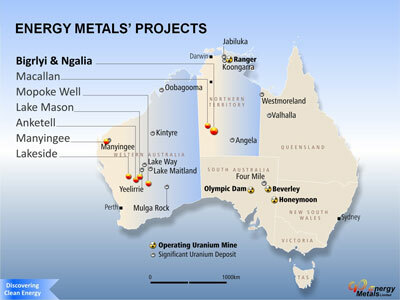 Energy Metals has eight projects located in the Northern Territory (NT) and Western Australia covering over 4,000 km². Energy Metals Limited is a dedicated Australian Uranium exploration company with a portfolio of advanced projects located in the Northern Territory and Western Australia. 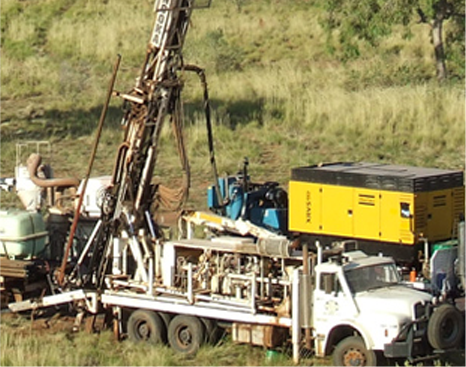 Energy Metals has eight projects located in the Northern Territory (NT) and Western Australia covering over 4,000 km². Most of the projects contain uranium mineralisation discovered by major companies in the 1970’s, including the advanced Bigrlyi Project (NT), which is characterised by relatively high uranium grades (with vanadium credits) and excellent metallurgical recoveries. Australia has significant uranium endowment with the continent containing approximately 29% of the world’s low cost uranium resources. With the improving political and public sentiment to uranium mining in Australia and nuclear power playing an increasing role in reducing global carbon emissions. Energy Metals is well placed to take advantage of the favourable outlook for the metal. Furthermore Energy Metals’ largest shareholder (with 66.45% of issued capital) is China Uranium Development Co., Limited, a wholly owned subsidiary of major Chinese utility China General Nuclear Power group (CGN) (formerly known as China Guangdong Nuclear Power Holding Company). At 31 December 2014, the installed capacity of CGN’s operating nuclear generating plants was 11.620 New from eleven nuclear reactors; with thirteen other nuclear generating units 15, 500 MWe under construction in various locations across China. CGNis one of only two companies authorised by the Chinese government to import and export uranium. This unique relationship with CGN give Energy Metals direct exposure to the uranium market as well as access to significant capital and places the Company in a very strong position going forward.